The flavors of a summer vegetarian pizza: shredded zucchini sautéed with leeks and corn then topped with feta cheese on a roasted garlic oil-brushed pizza crust. Pizza in the summer should be easy. Not that pizza in the winter should be complicated or anything, but there's something about the bounty of ripe produce coupled with spending more time outdoors doing yard work that lends itself to easy meals. With such delicious stuff coming in the the farm share box the pizzas practically make themselves (let's be honest, I'm doing the work here) the idea of what veggies to combine in a pizza practically falls into your lap. At least that's what happened with this pizza. Sometimes, the ingredients choose you (Meghan is so wise). Note: I made this pizza in January. It's true! I'd love to show you a photo with the pizza and the 3 inches of snow that fell in the morning, but in fact it was wicked cold and dark so I have no 'outdoor' natural light photos. 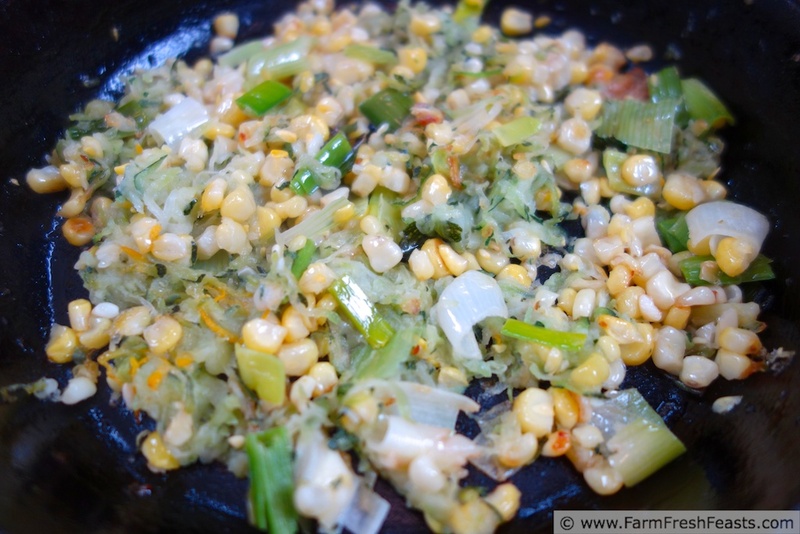 Over the winter, while rooting around in the freezer for something else, a bag of shredded zucchini, a bag of corn kernels, and a bag of chopped leeks fell into my lap. 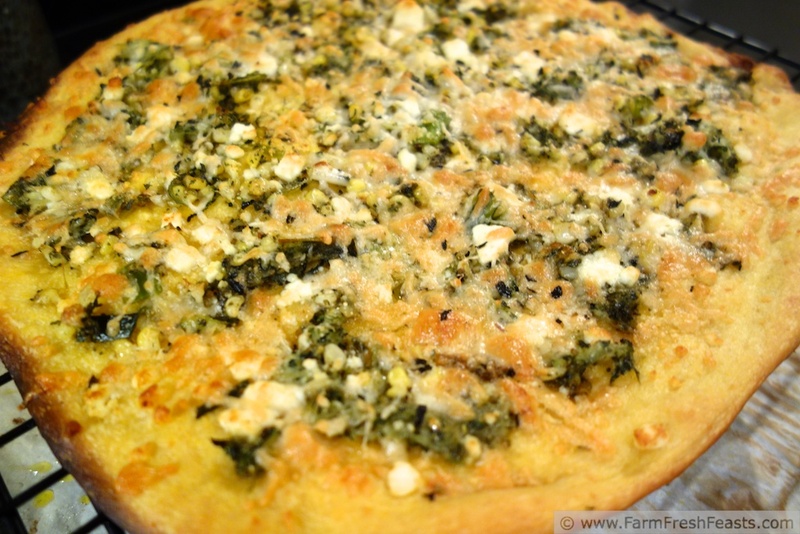 How did I make a pizza using zucchini and corn in the midst of winter? Easy! When I am overwhelmed with my crazy garden volunteers, or we get more than my family can eat in the week's CSA farm share box, I put it up. The zucchini was shredded (love the fine shred disc on my food processor, the smaller and cheaper version of this one) then bagged, and frozen. The corn was cooked in a cooler, cut off the cobs, frozen on a tray, and bagged. The leeks were sliced, washed a lot, spun dry, and frozen loose on a tray before bagging. That way, we can enjoy summer flavors all year long. And this taste of summer was delicious after shoveling snow! 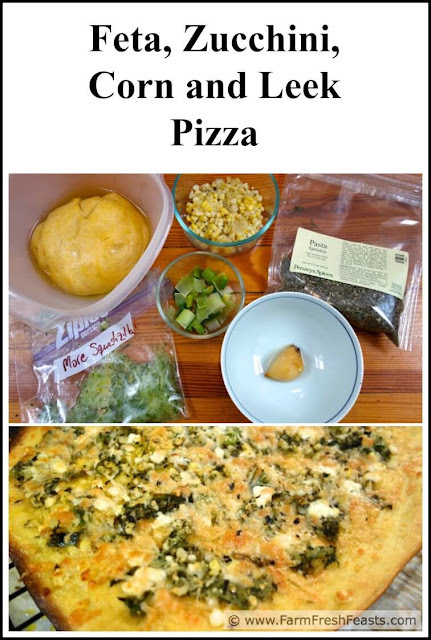 When I made this pizza, I knew that I eventually wanted to try leeks with corn on a pizza as well. When I got leeks in my farm share I even did a little happy dance. Tonight's pizza is very summery in nearly all respects--it's loaded with ripe-in-summer produce, tossed with pesto, flavored with a hint of garlic . 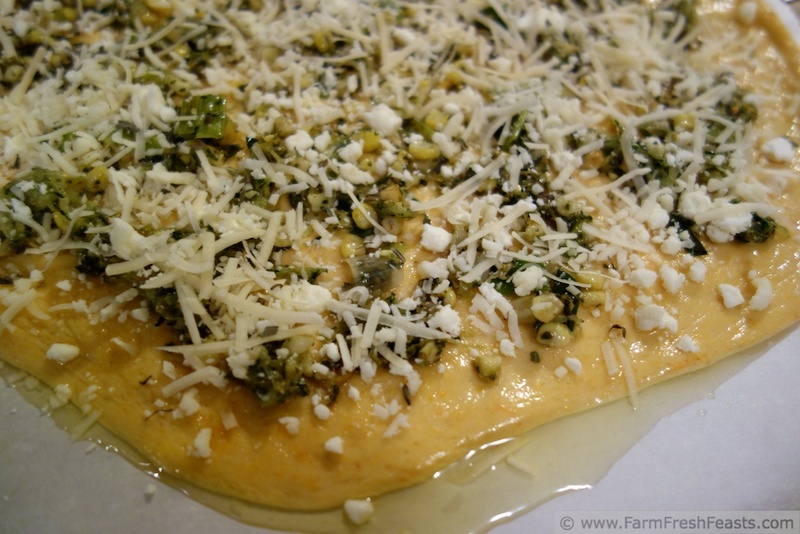 . . but I think I may have used an eggnogandbutternutsquash crust. So here's today's lesson, folks! Always Label Random Bags of Pizza Crust In Your Freezer. The crust tasted just fine with the toppings. In fact, it may have been just a plain butternut squash pizza crust (is that an oxymoron?). I'll never know, because I didn't label the bag! If this pizza looks delicious enough for you to want to make it now, not wait until January, just make sure to squeeze the shredded zucchini until it's as dry as you can get it. If you don't have leeks, substitute onions, shallots, or even green onions--but add them to the skillet at the very end because they burn easily. At least in my skillets. Now that my garden is growing some of these ingredients, I'm already planning my next "summer pizza" though this time I will know what dough to use. I'm missing the olive oil, pesto, and cheeses in this photo. Yes, I labelled the zucchini "More Squashzilla". For general pizza making hints, tips, and suggestions, refer to my Pizza Primer here. Preheat the oven, containing your pizza stone if you have one, to 450 degrees Fahrenheit. On an oiled piece of parchment, stretch out dough into the shape your family spouse currently favors. Set aside. In a small dish, smash the garlic with the olive oil, set aside. Preheat a medium skillet over medium heat, add a teaspoon of oil and sauté the zucchini 3-5 minutes until it's softened. 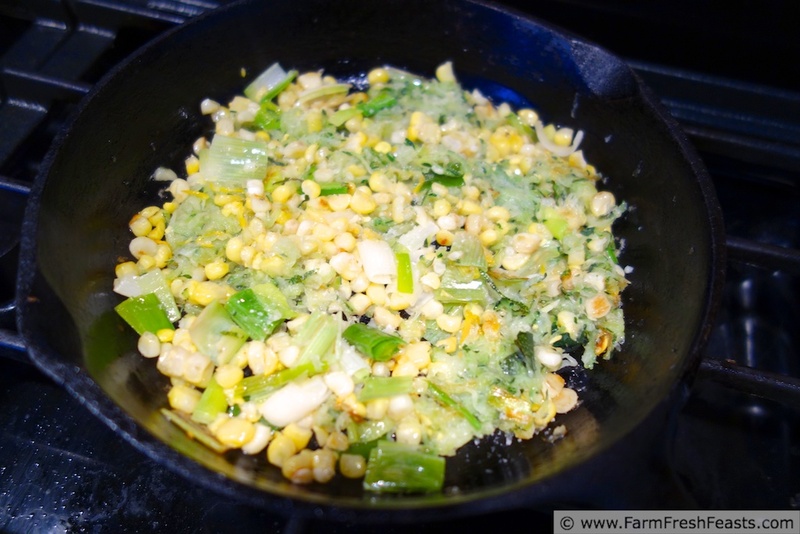 Add in the leeks and corn, and sauté another 3-5 minutes until the veggies get a hint of brown on the edges. Sprinkle with kosher salt. Remove from heat and plop pesto into the skillet, stir to combine, and set aside. Brush the roasted garlic oil over the crust. Spread the pesto veggies over top. Scatter feta crumbles even over veggies. Top with shredded cheese and a shake of Pasta Sprinkle. Bake on parchment for 5-8 minutes, then shake the crust directly onto a stone, or cookie sheet, for another 3-5 minutes until cheese is browned and bubbly. Cool a few minutes on a rack, slice and serve. This pizza is playing with the farmers at the From the Farm Blog Hop, What I am Eating, the Clever Chicks Blog Hop, Mostly Homemade Mondays, Tasty Tuesdays, What's Cookin' Wednesday, the Wednesday Fresh Foods Link Up, and What's In The Box. Yeah, I was a little too liberal with the 'oiled piece of parchment'. It wipes up easily before baking. Ok, this is a blog after my own heart. Love everything about this pizza, especially the parts that came from the freezer. I have one of those, still brimming with a lot of stuff I put down last year. Meanwhile, the monster zucchinis are growing again....bwah ha ha. Thanks so much for your kind comments! Luckily for me, my daughter unplugged my main fruit and vegetable freezer (which gave rise to the berry crust pizza post) so we got a jump on defrosting and prepping for summer several months ago. I started summer with a bit of pesto and a bunch of berries, and I'm great with that. I don't know what it is about zucchini, that it grows when your back is turned. The mystery squash (I'm thinking it's sugar pie pumpkin again-yay!) is a slow grower, as is the butternut. I suppose that they are both winter squashes and I am comparing apples to coffee cups, but still. Zucchini for me is too little . . . too little . . . too little . . . Squashzilla. I love a good "whatever came from my CSA" pizza. This one looks really delicious. Rumor has it, our farmer is growing corn this year, so maybe we'll actually get some and I can try this pizza. We lucked out last year and our farmer got corn from a friend. It was wonderful! Tragically I'm the only one in the house who can eat it *on* the cob for the next year, so we put up nearly all the corn we get. It was Aubrey of Homegrown and Healthy who first commented that things that ripen at the same time taste good together, and this is another example of that. I haven't started putting up anything (other than garlic and berries) because I'm so happy enjoying the fresh flavors after so long. I need to get on it. As always, your pizzas are so creative and damn delicious! I'm finding the summer pizza inspiration is staring me in the face when I open my farm share box, and that's easier than opening the freezer and rooting around in the bags for sure, but yeah, I'm throwing whatever on the pizza all year long. Last week it was radish pizza which, from the colors, would be perfect for Easter, but I don't know if I want to sit on the post that long. I definitely agree that summer pizza should be easy. We use naan, flatbread or tortillas from the store and put our toppings on from there and it is quick and delicious. I'm going to keep these pizza toppings in mind for the next time we make them! I really need to pick up extra naan when I see it in the day old section, because you're right, it would make an easy pizza. As it is, I've been using pizza crust yeast and it goes so quickly for me I'm considering it my 'easy summer crust'. Crazy, I know. But consider the source--me! I love all the seasonal produce on this pizza. Looks gorgeous! Another great Friday night pizza! I like to use naan for my easy summer pizzas (especially the garlic naan). Garlic naan--yum! My daughter just scooped up some leftover Indian-spiced stew with garlic naan for breakfast (the kids will not eat cereal). And with that, we're out of naan again. Apparently I need to learn to make that, as well. I suppose my pizza stone would work for it. This looks AMAZING! You always make the best pizzas. =) And I love that you labeled it "squashzilla" - I call our huge, out-of-conrol basil plants Bazillas, too. HA! Bazilla--love it! Think of the pesto you can put up! I am loving the flavors on this bad boy, and by bad boy, I mean good; damn good. I've got zucchini in the oven right now, roasting away with baby tomatoes, but I have plans to put some up too, especially now that I have your wonderful instructions. Keep teaching me master. Ah, Meghan my Padwan, keep sharing musical suggestions and #publicbanana (did I do that right) with me and I will learn you everything I know. Love the combination of flavors! And I love the colors – so light and springy, in the middle of summer, or winter. :) Perfect! You should see the colors of the radish pizza I did the other day--white, pink, red and purple, with white cheese and garlic oil--they were so pretty and Springy. This looks delicious, I love the flavor combination! Sometimes I find unlabeled dough in my freezer. It's funny, because when I made it I knew exactly what it was :) I should learn my lesson. I'm thinking grilled pizza soon! I've been so good about labeling stuff lately just because of this--we'll see how long it lasts. We're starting to use the grill more this summer--but no pizzas yet. I think I need to watch and learn for a few more . . . years . . . before attempting my own. With zucchini becoming plentiful in the gardens in the North East right now this is a perfect time to receive a recipe like this. The pizza looks just amazing. I can't wait to make it. I'm seeing winter squash growing all over my yard--but apparently the summer squash didn't care to volunteer this year. No worries, the farm share is giving me plenty! This is such a great summer pizza! 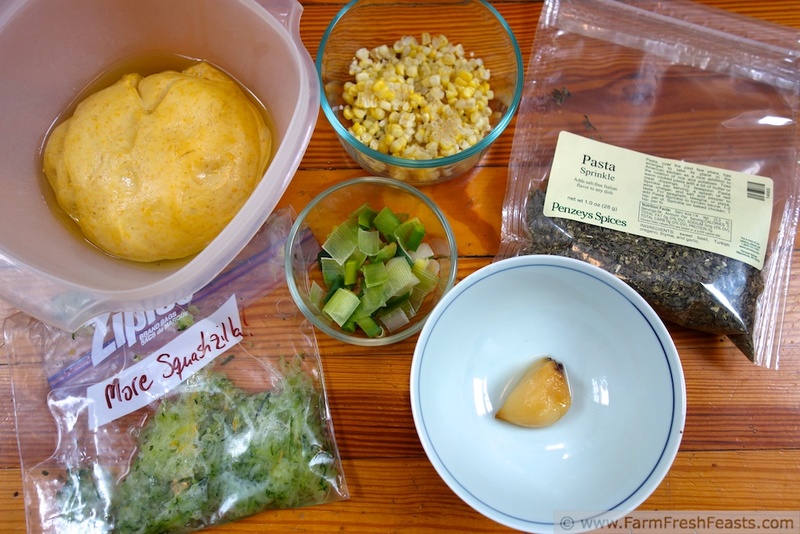 Thanks for linking up to What's Cookin' Wednesday! The flavors sure screamed summer to me. Or maybe that was me screaming about frozen veggies in my lap, I dunno. Thanks for hosting! It sure was--can't wait to make it again (ok, on a different dough, one that I know what kind it is!) with fresh veggies in the summertime.